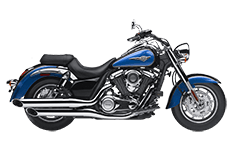 As the Kawasaki Vulcan series climbs higher in engine size, riders look for tougher accessories that can last as long as they can. We're proud to introduce our lineup of Viking Bags manufactured specifically for the 1700, a luggage collection built to withstand everything you can. With enough features packed in each set to carry your goods across the country, you'll be left wondering why you didn't choose a Viking Bag sooner. But you don't have to take our word for it; click on an image to learn more about that saddlebag.